Imelda Marcos, a Filipino politician and widow of the 10th President of the Philippines, has a collection of 2,700 pairs of shoes. If she wore one pair a day, it would take over seven years to wear them all. While I don’t own nearly as many pairs as the famed Ms. Marcos, I do have a closeted (pun intended) shoe obsession. Stilettos, sandals, and boots, oh my! They sit in my crowded closet, on shelves, like art. Lovely, wearable art. Shoes are an outward expression of someone’s personality and interests. They don’t tell the whole story but have a way of summing it up. Mine beautifully summarize the fact that I love to travel! It’s my ‘Around the World in Eighty Shoes’ Plan! I’m a shopper and I love to see what’s on offer in other places of the world. I like to experience the boutiques and markets of far-flung places and examine what’s in-fashion abroad. I bring the style home and walk with an extra bounce in my step knowing I’m reflecting the panache of fashionistas the world over. Around the World in Eighty Shoes...Off to a Good Start! 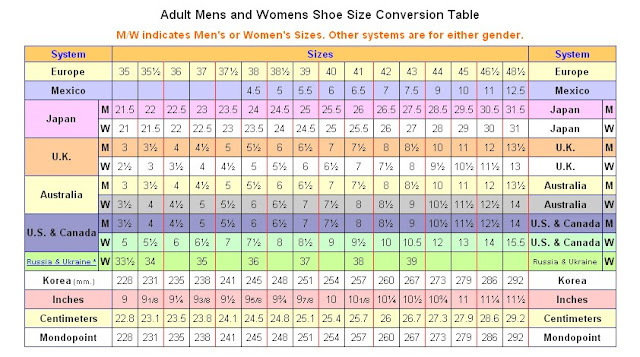 Shoe sizes vary in each country. 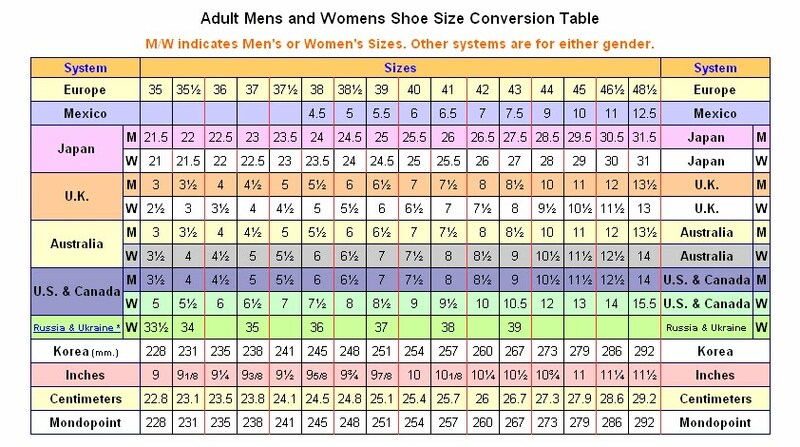 Refer to the following chart before you begin your quest for the perfect ‘shoe’venir. Happy shopping!